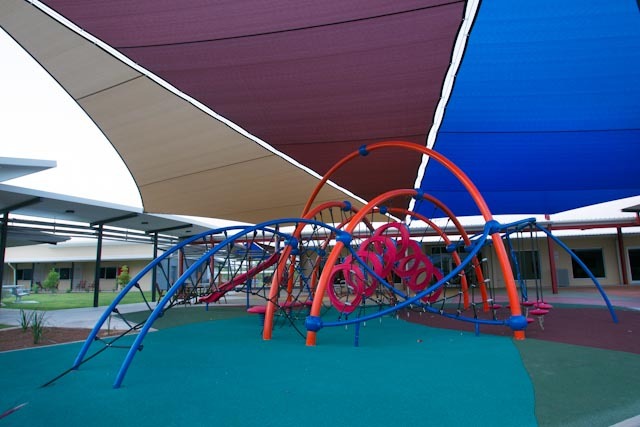 Designed in conjunction with Mode Design, the play area for the Royal Darwin Hospital’s long stay facility required robust and unique playground equipment in two areas – 2-5 and 5-12 years. We selected the Evos and Weevos structures that were not only aesthetically pleasing, but also challenging to the user age ranges. Clear sight lines provide easy supervision in this environment as well. Both play structures were installed as a surface mount option so that rubber surfacing could be adhered to concrete, providing longevity. Peripheral concrete paths, designed by local artist Tom Gray, link the playground equipment and rubber surfacing with complementary colour choices throughout.